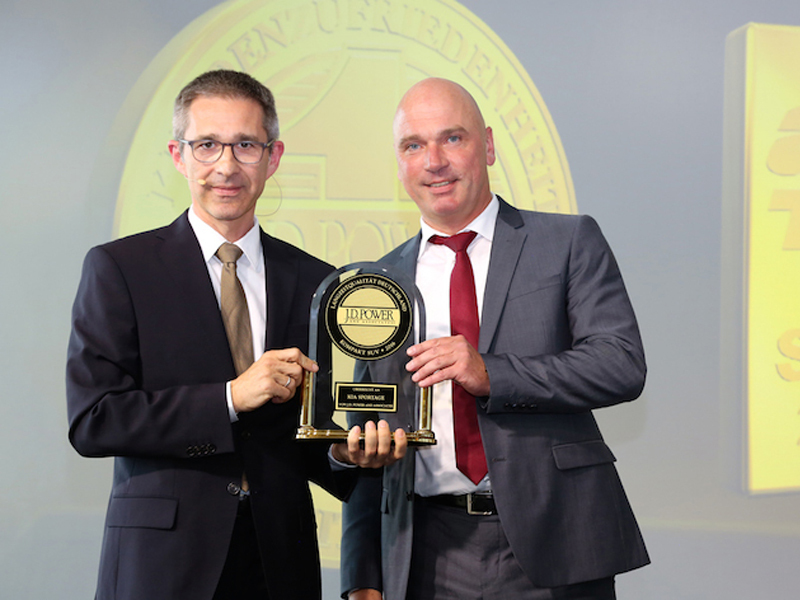 Frankfurt, 22 July 2016 – The Kia Sportage has picked up another award for its quality and reliability, securing first place in the 2016 J.D. Power Vehicle Dependability Study. The result comes only six weeks after the Sportage completed a 100,000-kilometre endurance test conducted by German car magazine, Auto Motor und Sport, where it became the first car in the publication’s history to complete the test without a single fault. In J.D. Power’s Vehicle Dependability Study, a long-term product quality survey, the third-generation Sportage stood out with an extremely low number of faults, measured by J.D. Power in problems per 100 cars (PP100). The Sportage’s result of 45 PP100 not only resulted in victory in the Compact SUV segment, but also placed the car first among 68 models from 24 manufacturers in the overall ranking. The Sportage, which is Kia’s European bestselling model, recorded a 13-point lead over the second-place car. The Kia Sportage displayed no weaknesses in any of the disciplines and in categories for Exterior, Interior and Air Conditioning achieved the best ratings of any car in the survey. The Vehicle Dependability Study is conducted annually and is the largest long-term satisfaction survey of German car owners. This year, J.D. Power surveyed 15,453 motorists. The results will be published on 27 July in German car magazine AUTO TEST. Steffen Cost, Managing Director (COO), Kia Motors Deutschland, said: “Our customers’ exceptionally high degree of satisfaction with the Kia Sportage is very gratifying. It is further proof of the quality of our cars, which also gained us first place in the ‘Qualitätsreport 2015’ [Quality Report] by Auto Bild magazine and which we underscore with our free 7-year Kia quality pledge. The fourth generation of the Kia Sportage – which, like its predecessors, has received the globally prestigious Red Dot and iF design awards – features a distinctive new ‘face’ and has a longer body than the third generation (4,480 mm; +40 mm). Due to the longer wheelbase the cabin now offers greater space for all passengers, while cargo volume is also bigger. The high quality interior with newly-designed seats offers premium comfort features, such as seat ventilation and electrical seat adjustment. Partial leather upholstery is available in a range of colours. Depending on specification, the Sportage is equipped with 8.0-inch touchscreen navigation (including the Kia Connected Services connectivity package), JBL premium sound system, wireless smartphone charger, Smart Power Tailgate and a smart parking assist system. Powertrain choices include five gasoline and diesel engines, with power outputs varying from 115 to 185 ps. Depending on the engine, the vehicle can be specified with front-wheel or all-wheel drive. The powertrain options include Kia’s new 177 ps 1.6-litre T-GDI (turbocharged gasoline direct injection) engine, which can be specified with Kia’s sporty 7-speed double-clutch transmission. The new sports-inspired GT Line model is available with the T-GDI engine and the most powerful diesel engine in the line-up, a 2.0 CRDi 185 ps with all-wheel drive. The new GT Line model has a carefully-tuned chassis and many exclusive design elements and features, inspired by Kia’s high-performance GT models. The new Kia Sportage achieved a five-star Euro NCAP crash safety rating (2015). Depending on specification, the new model’s safety equipment includes Traffic Sign Recognition, Lane Keeping Assist System, Lane Change Assist, Cross Traffic Alert and Autonomous Emergency Braking (including pedestrian recognition. The global marketing information services company J.D. Power, which was founded in the United States in 1968, is internationally renowned for its customer satisfaction studies, which it has conducted in Germany since 2002. Over 15,000 motorists were interviewed online for the latest Vehicle Dependability Study, and asked to provide details of their experience with their car, which they will have been driving for two years on average. Only models for which at least 75 assessable answers were submitted were included in the survey. Vehicle Dependability Study results are divided into categories for Quality / Dependability, Attractiveness and Running Costs. All responses are weighted and the results are used to draw up a ranking according to frequency of problems. Since 2008, J.D. Power’s customer satisfaction studies have been published in the German car magazine AUTO TEST.